An allegory of Moravia: a map in the shape of the globe, i.e. the Moravian world, is surrounded by celestial powers, representative of the states (clergy, nobility, towns) and allegorical figures. The woman with a mirror kneeling on the left personifies Prudentia (deliberation or foresight), while Fortitudo (courage or resolution) is represented by a female figure with a massive column and a Heraclean lion-skin on her head, close to another female figure with an hourglass embodying Moderatio (temperance or self-discipline). The symbolically raised hand with the scales over Moravia belongs to Justitia (Justice). The dignified man with a wig, with one hand on a fasces (a bundle of white birch rods) and the other on a statue of Pallas Athene, may be interpreted as an allegory of bonum consilium – good advice – as well as education. 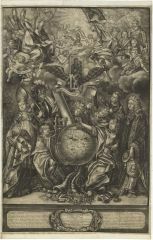 The celestial powers testify to the prosperity of the land under Emperor Leopold I (1657–1705), whose monogram LI is the centre piece of the print. The fruit of his beneficent reign is indicated by cornucopias, as well as by the attributes of education, and stones with planetary symbols corresponding to silver and iron, the wealth of the country. At the centre, the imperial eagle supports a picture of the miraculous Virgin Mary of St. Thomas, accompanied by patron saints Cyril and Methodius on the left and St. Wenceslas on the right. The function of the celestial sphere carried by angels is specified by the words: “Divine power rules the celestial worlds” on a band. The peculiar manner of representation, with Moravia as a globe, is elucidated by the second part of the sentence, at the interface of the heavenly and earthly spheres: “and the emperor rules the Moravian world with fatherly, powerful care”. The print originated as part of an Olomouc University thesis. After taking exams, graduates had to participate in public debates, the theses of which were printed as announcements. Some of them were engraved after templates by Moravian painters in the renowned Augsburg workshops. The print originated as an Olomouc thesis. Some of these were engraved after templates by Moravian painters in the renowned Augsburg workshops. 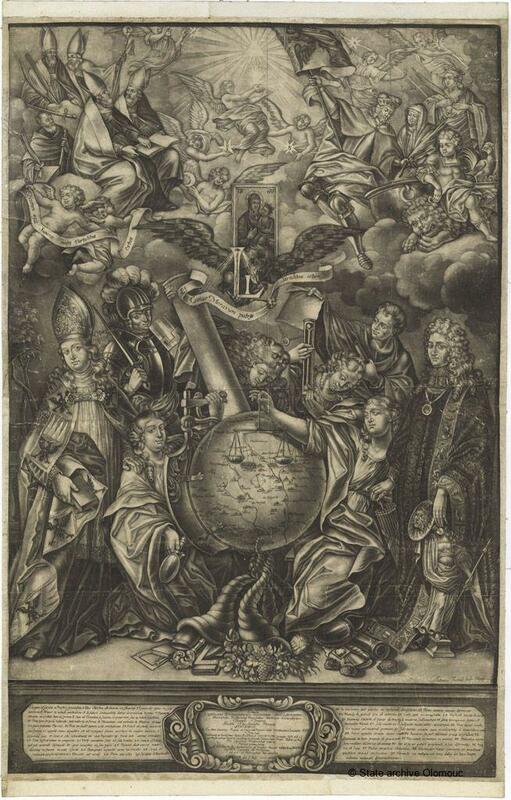 As well as the principal patron saints of the land, the print presents personifications of good government, considered to be a prerequisite of the country’s prosperity. The original artist remains unknown. The print is signed by the Olomouc copperplate engraver Antonín Freindt (1664–1727). The print also features the name of the person who commissioned it and whose thesis is seen in the Latin text at the bottom section of the print. The print was a part of a collection of university theses from Olomouc University, established in 1573 as a Jesuit College. The collection was taken into the state archives in the 1950s. Josef Válka, in Ivo Krsek – Zdeněk Kudělka – Miloš Stehlík – Josef Válka, Umění baroka na Moravě a ve Slezsku, Prague, 1996, p. 18. Milan Togner, in Jiří Kroupa (ed), Dans le miroir des ombres. La Moravie a la age baroque 1760–1790, Brno–Paris–Rennes, 2002, pp. 86–88, cat. 3.